...tell me, am I right or am I right? So bright and cheerful. I'd love to do this again with a colour family - light to dark purple, or teal, would look amazing. Here's the tutorial - please subscribe to my channel ☺. If you watch the video, you'll see that this tutorial is part of my very first YT collaboration. I'm pretty excited about it! Bridgette runs a channel called EyeDolize Makeup, and she has the most beautiful and creative looks. The best part about her channel is that it's not just every day makeup, it's art. That's like me; while many of my designs aren't what people would like to wear at work and in everyday life, it's the art that draws me - and, as I've learnt, other people - in. It's the art that keeps me passionate and motivated, it's the art that makes it special, it's the art that makes it so "me." Sometimes the fact that it's all done on nails seems almost irrelevant! 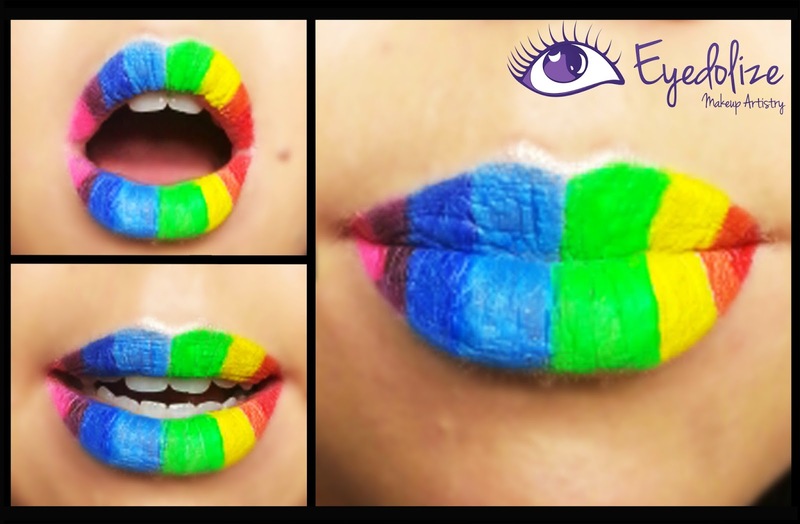 You can watch EyeDolize makeup's tutorial for rainbow lips here. How cool would these lips look paired with these nails?? Watch the tutorial for them here. I was a little gutted when these came off after only two days, but that comes with the job when you're doing someone else's nails. At least I've got the photos ☺. I'm just loving the blog/youtube/internet side of my nail art. I love training too, and am sure I will work as a nail technician, but maybe not full time. I've recently had a pretty cool opportunity come up and while I can't share it with you yet, I can't wait to! 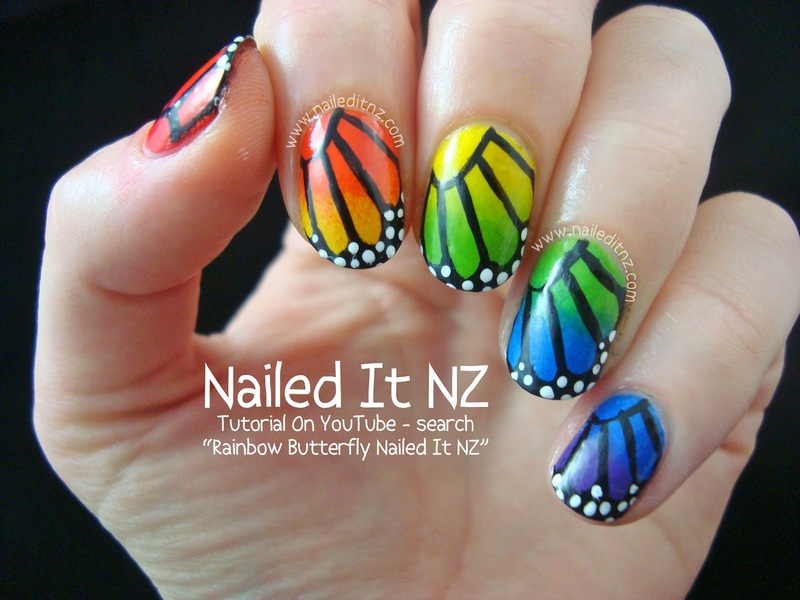 It's kind of a start towards making Nailed It NZ more than just a blog, but I won't say too much ☺. 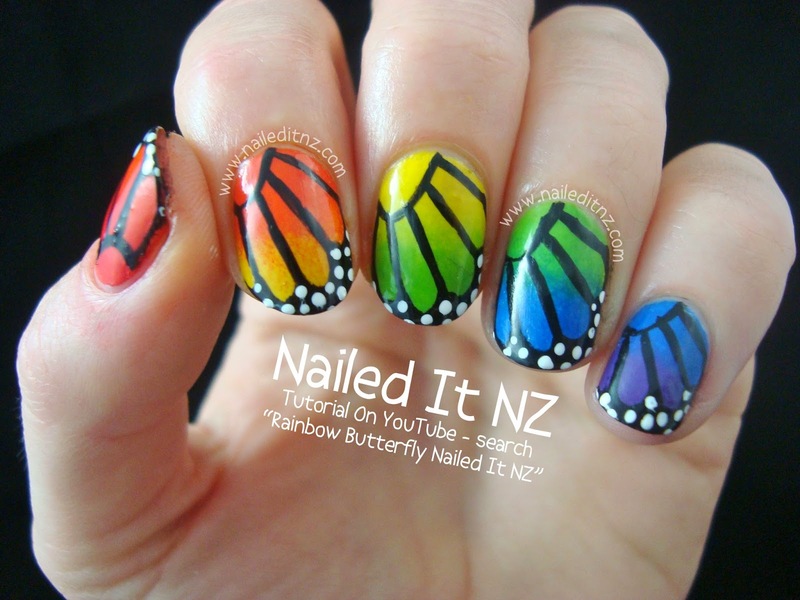 It's worth noting; I searched "rainbow butterfly nail art" on YouTube after publishing this tutorial and I found a similar one - I didn't copy it, promise! Butterflies and rainbows are very common designs, and I'm sure it's been done thousands of times. Still, I feel a bit awkward about it (even though the method's different) so I'll share the other one - Juliatmll's version can be found here! Hope you like these as much as I do, and have a fantastic day! oh my gosh!!! I love this look, I loved the tutorial, and I loved the collaboration! Super cool, girl.